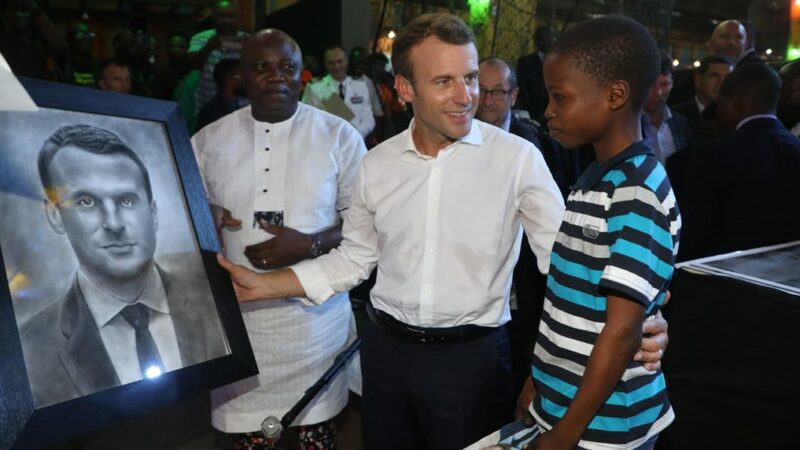 For effortlessly drawing a portrait of France’s leader during his visit to Afrika Shrine in Lagos, an 11-year-old Nigerian boy Olamilekan Kareem has caught the attention of Emmanuel Macron. Macron is on a visit to Nigeria where he met President Muhammadu Buhari in Abuja and also paid a visit to Afrika Shrine, which is regarded as the home of Afrobeat, a genre of music founded by the legendary Fela Anikulapo-Kuti. “Very touched, congratulations to this young boy.” Macron tweeted on Tuesday. The French president, who was once a junior diplomat in Nigeria emphasised on the importance of the shrine to the African culture and hope many Europeans will be exposed to appreciate. Singer and actor Banky W, who anchored the event described praised Kareem for his skills. “This is the level of talent we have in Lagos; an eleven-year-old Kazeem drew this within 2 hours,” he said.